Charles was born in Geraldine on 8 January 1890, the youngest of five sons and six daughters of Charles Henry an Fanny (nee Gould) Verity. His father, Charles senior, had been a prominent sportsman in his younger days and was a well known farmer. Charles (junior) enlisted on 17 April 1915, and gave his father, Mr C.H. Verity of Craigmore Downs, Cave, as his next of kin. He stated he was 25 years of age, a self employed farmer, and his address was that of his father. His enlistment papers described him as being Anglican, single, 6 foot 1 inch tall, of dark complexion, weighing 188 lbs, chest measuring 38 inches, and having brown eyes, black hair, with good teeth. He also said he had had previous military experience whilst at Waitaki Boys High School in the cadet unit. 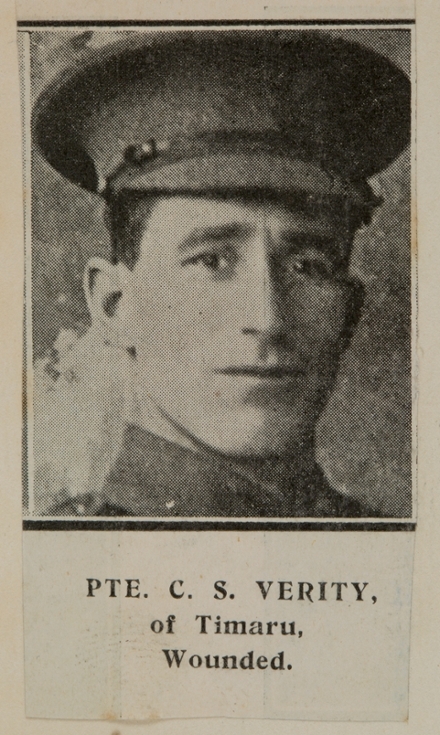 After training with C Squadron, Canterbury Mounted Rifles, he embarked with the rank of Trooper from Wellington on 14 August 1915, with the 6th Reinforcements aboard the Tofua, bound for Suez, Egypt. On 13 November 1915, he joined the 8th Mounted Rifles at Gallipoli, and returned to Alexandria, Egypt on 26 December. The rest of his service was in the Canal Zone, Egypt, where, on 9 August 1916, he received a gunshot wound to his left leg, and was admitted on 12 August to the 1st NZ General Hospital, Brockenhurst, England. On 1 December he was transferred to the Convalescent Depot at Hornchurch and from there, was returned to New Zealand aboard the Marama, arriving home 8 March 1917. Found unfit for further service due to wounds received in action, he was discharged from the army on 5 April 1917. For his war service he was awarded the 1914-1915 Star, British War Medal and Victory Medal. In August 1967 he was presented with the Gallipoli Badge and Medallion. On 5 December 1917 Charles married Mabel Christine Armstrong and they were to spend the majority of their lives farming at Craigmore Downs, Cave. Charles died at Invercargill on 5 October 1971, aged 81 years. Charles was cremated at Salisbury Park, Timaru, where he and his wife’s names are listed on the Wall of Remembrance.